The below video recipe is for 1 kg fish and with a higher quantity of spice. Samy, 1 minute when the curry is on a rolling boil, if you are simmering it, then a couple of minutes. Actually fish should never be overcooked as it continues to cook in its steam even after you take it off the flame and especially so for delicate fish like Kane or small sized fish. 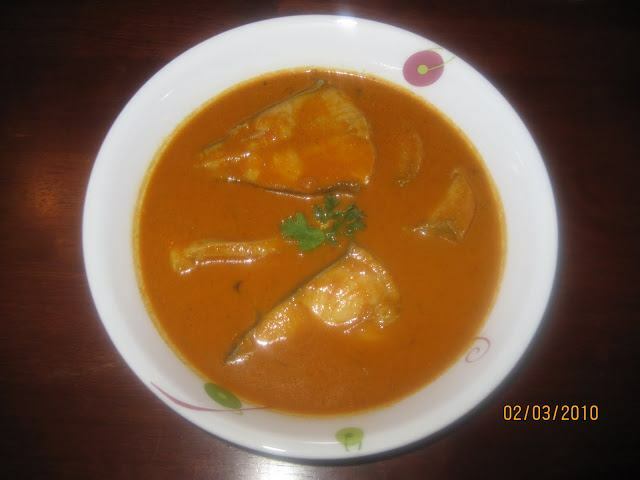 If you have large surmai (king fish) slices you can simmer it for 2 minutes…hope this helps! Sam, it also depends on what variety/quality of fish you get there, like for example, we get large Kane (Lady fish) in Mumbai with slightly tougher meat than what we get in Mangalore, so you can use your judgement, remember that overcooked fish will fall apart (crumble) – 'kispaartha' as we say in Konkani, if you overcook it. Hehe, good luck Sam & lemme know how it turns out 🙂 and thanks for the compliment, it means a lot to me, hugs! Made this yesterday.. a super hit !!! Thanks a ton Olma! Glad u liked it! Shireen you are too good dear. God Bless You! Excellent recipe.From now on I will always follow this recipe for fish gravy.it's just yummy. Thanks. What about pomfret? Still 1 min only ? can u post some receipe for black pompfret. I will definitely post recipes for black pomfret soon! Do stay tuned for more recipes! excellent !!! Thank you Shireen..fish curry with panpalle everyone enjoyed it. Thanks so much for your feedback Marina! My thumb rule which has never failed – Fish in on rolling boil – 5 minutes with lid off. Allow to cool and serve with whatever dressing you may choose. Thank you for this recipe, its simple and easy and not too hot, my daughters enjoyed it. So glad to hear that your daughters enjoyed it Sunita! Thanks for the feedback!